Breezer Boombox is the new Music Maker app in town. Hosted on Breezer India’s Facebook channel, the simple application does a good job of adding colour to the brand’s interactions with followers. 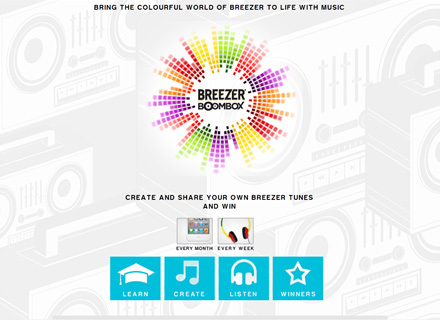 Breezer’s new credo is ‘Live Life in Colour’ and the app makes liberal use of this theme and packs a musical punch. Once you get on with it, you realise it is a fairly simple app, where you can select your favourite genre, choose a favourite Breezer flavour, play around with your track by adding pauses and peppy beats, hear what you have created on the sequencer and if it’s good enough, download and share. Because it is a light execution, it is good for a couple of tries. Beyond that, it could get repetitive. I would have liked more track options to play around with but this is a cool attempt for a short term contest. This would be a great execution on rich media as well. The creative elements are what make this good and keep it interesting.